Col Daniel J. Wattendorf, MC, USAF, joined DARPA as a Program Manager in the Defense Sciences Office (DSO) in 2010. In 2013 he joined the newly formed Biological Technologies Office (BTO). His interests focus on applying methodological advances in genomics and biotechnology to optimize health and prevent disease, including novel RNA vaccines to improve effectiveness and reduce production time. He holds a Bachelor of Science in microbiology from Cornell University and a medical degree with distinction from George Washington University. He completed a residency in family medicine at the National Capital Consortium; a residency in clinical genetics at the National Human Genome Research Institute (NHGRI), National Institutes of Health (NIH); a fellowship in clinical cytogenetics at Georgetown University; and a fellowship in health policy from the Office of the Director, NHGRI, NIH. 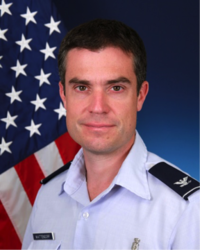 Col Wattendorf previously served as Director, Air Force Medical Genetics Center and program manager for an Advanced Concept Technology Demonstration integrating advanced diagnostics and informatics with surveillance systems to rapidly detect natural and hostile pathogens in the Office of the Air Force Surgeon General. In addition to his DARPA programs, he is a geneticist at the National Naval Medical Center and the Cancer Genetics Branch, National Cancer Institute, NIH.